[Jesus prayed,] "I brought glory to you here on earth by completing the work you gave me to do. Now, Father, bring me into the glory we shared before the world began." Jesus did everything his Father told him to do. Imagine, finishing your task at such a young age! But isn't that what Jesus did? So often we don't look on obedience as a way to give God glory. Powerful praise songs in worship seem like a much more exciting way to give God glory. Leading someone to Christ is another example of giving God glory. 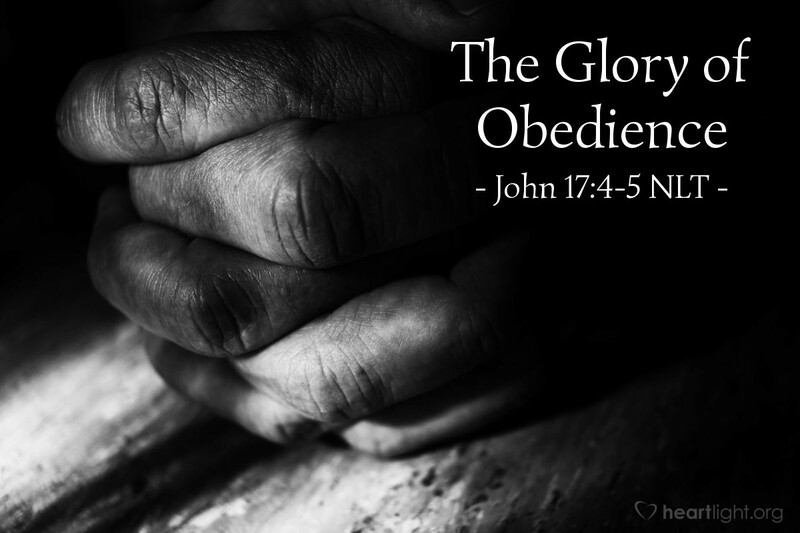 But let's not forget that in the intentional acts of obedience we offer to God — both the simple and the hard things, both the every day and the heroic ones — we are bringing God glory! Obedience is worship incarnate, worship coming to life in our flesh (Romans 12:1). So rather than looking at obedience as a demanding and sometimes harsh thing, let's look at it as the embodiment of praise! Father, thank you for sending Jesus to be my example. I know that he was obedient from the heart to all your desires and commands. I sometimes falter and fail in my obedience. Please forgive me. Open my heart to understand that my obeying you brings you glory. In Jesus' name, I pray. Amen.